Salami on a pretzel, genius! Someone asked me the other day with all our travels, where would I choose to move to. My first reaction is always "Paris!! ", but the practical part of me likes to think Switzerland would be an ideal place to raise a family. It's got all the stylish appeal of France, with none of the instability that plagues the government and economy of Là République. Switzerland is one of the wealthiest countries in the world, their population is highly educated, and I'm envious of their fluency in three (or more) languages. Plus they make chocolate and everything runs on time. Sounds ideal to me. Mr. C&G likes to point out that if I'm not a fan of Maine winters I won't fare much better in Switzerland, but I prefer to ignore those pesky details. 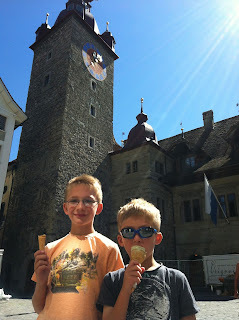 One of the best lunches the little C&Gs had on our trip last summer was in the Swiss city of Lucerne. 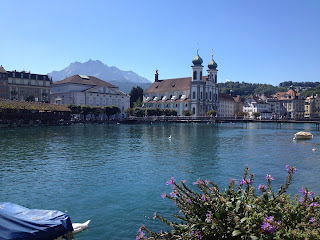 We stopped in the picturesque lakefront city on our way to Zurich from the Swiss Alps for just a few hours, but we easily could have spent a few days exploring the beautiful city. 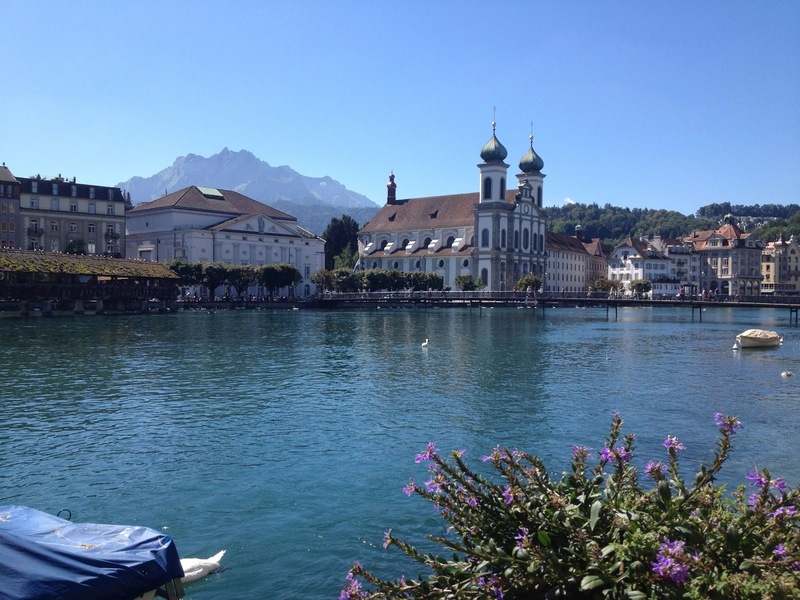 Lucerne is set along the sparkling blue shores of the Reuss River and Lake Lucerne, with narrow streets and charming squares that fan out from the waterfront. The little C&Gs still talk about the delicious gourmet pretzel sandwiches we had at the waterfront restaurant Rathaus Brauerei which we found thanks to my trusty travel companion Rick Steves. We grabbed a riverside table at the height of lunch hour and enjoyed the scenic views of the snow capped Alps in the distance and Europe's oldest wooden bridge just a few feet away. 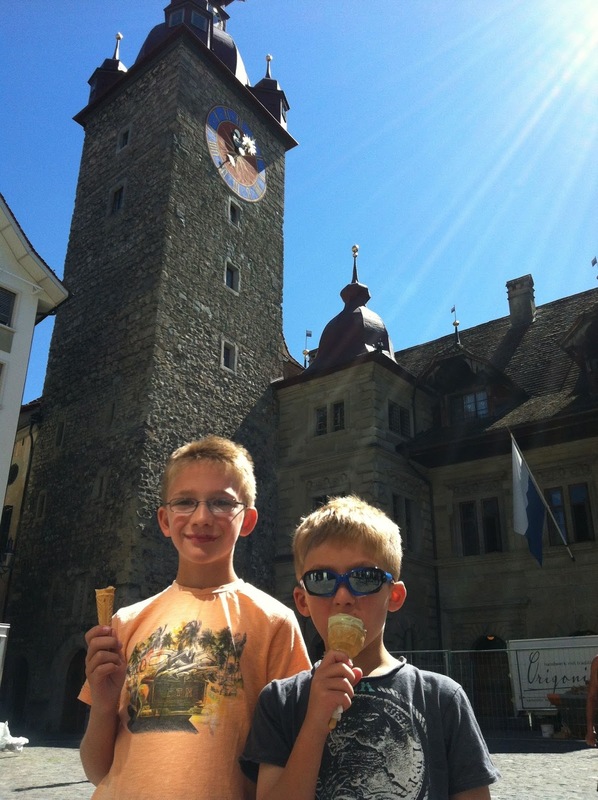 Both boys gobbled up their salami and cheese on a pretzel in no time and happily would have ordered another if they weren't saving room for gelato at one of the many stands along the water. 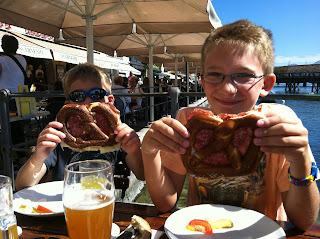 All that Swiss daydreaming reminded me about the boys love of lunch on a pretzel. Just one week into summer vacation and already they're complaining about the lack of lunchtime options around C&G HQ. I'm sure they complained all throughout the school year when they unpacked their lunchboxes, but at least then I wasn't within earshot. I'm thinking I might need to take inspiration from the smart and efficient Swiss and throw a few pretzel sandwiches into the mix. It's a brilliant idea and sure to entice them into eating more than a few bites before heading off to the next activity. But if it doesn't work, I always have some Scandinavian ideas to try. Although I'm not sure I'll find reindeer at my local grocery store. Dining at the Other C.I.A.